I was thinking today that toy manufacturers must not actually interact with children. See, I had a painful meeting of the sole of my foot with a large piece of Lego while I was carrying the baby this morning. Someone had kindly dumped their Lego’s in my room just so that something like this could happen. Toys like that should come with a warning: “Painful if stepped on.” Sure they are educational. You learn about construction, colors, physics, and pain. And what about noisy toys? “Will cause insanity if listened to repeatedly“. 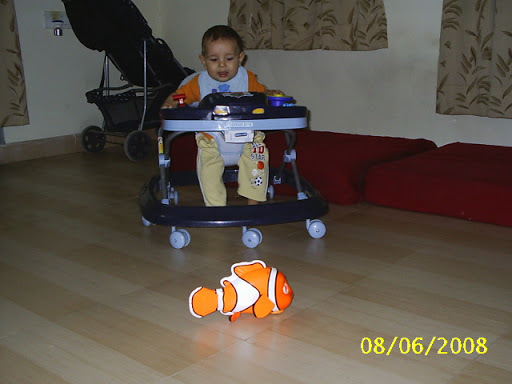 Logan had a Nemo toy when he was a baby that sang the most irritating song, and it wouldn’t go off either, unless I turned it off. He loved it; I didn’t. Lila has a duck that used to quack. Now it doesn’t after too many trips in the washer. For Christmas I put some phones in their stockings, and regretted it by the end of the day. I was happy when those stopped working. And let’s not forget the annoying sounds that came from that walker music tray. Painful! I was so happy when that one died. I can just imagine it: a roomful of toy designers (who are all childless) sitting around a very large table in a quiet room, discussing what they should make next. “This new toy has to be attractive”, says one. “What about loud? Kids love loud things.” quips a third clueless designer. … and this is how noisy, painfully annoying toys come to be. They should all be sold with complementary earplugs!!! Lila seems to be practicing for a life of trouble…or maybe she is just being a normal 2-year-old. She keeps me busier than the other two combined! She has to do at least one thing daily that makes me wish I had a playpen her size that I could lock her in (it would have to be escape and sound proof), though she usually does more than that. Today for instance: I was getting a head start on dinner so that when Scarlett gets fussy I can see to her and not worry about dinner being late like it usually is. Lila came to me with something white and runny on her hands – she had dumped a (thankfully small) bottle of baby lotion on my bed, rubbing it into the sheets. When I went to look at it, she said, “Oh God, Lila”, imitating what I say to her whenever she creates a disaster of epic proportions and I am pressed for time but have to clean it. I had no idea I said it so much that she knew it. Actually, I only say it when I’m really upset – I’ve had a long day, listened to too many hours of screaming and crying, when I’m on edge and need a break. It is never-ending with her – I swear! Yesterday she dumped a bottle of laundry bleach all over the balcony and herself; she regularly dumps water on the floor in varying quantities; she has flooded both the living and dining rooms; she sticks her hands in the flour and licks them when I’m rolling chapattis; she will systematically drop her dinner on the floor if she doesn’t want to finish (usually I’m nursing the baby and can’t go to her); she loves to play with soap, and will take the bar to her room, or my bed, dig into it and rub it all over herself. She rips things, breaks things, opens most anything, eats anything, and then runs when I catch her. She has learned how to run around the furniture so I can’t catch her easily but will then usually get herself stuck in a corner. Ironically, she rarely gets hurt. At the most she will get a scratch or a bump, nothing serious. The turpentine incident has been, by far, the worst trouble she has gotten into since her trouble-making days began. I just hope she won’t have anything worse happen.